MailOnline has secured what it claims is a media first for a UK online newspaper by allowing Iceland, the frozen-food retailer, to take over the news website's masthead today. 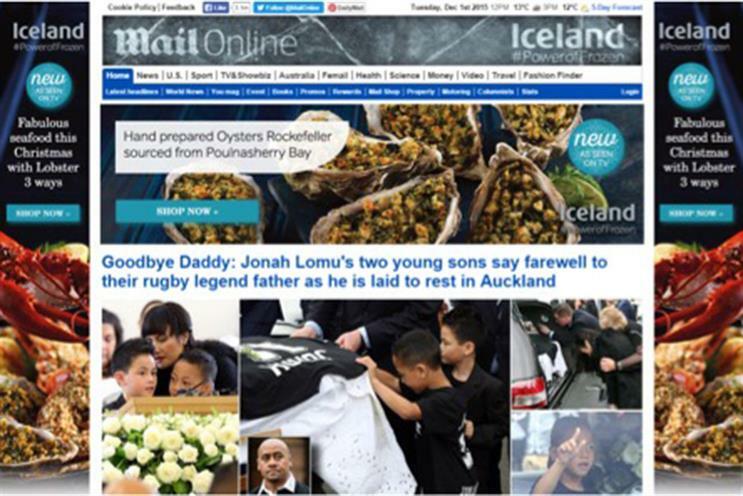 The background of the MailOnline masthead at the top of the homepage will be turned icy grey with Iceland branding, before the masthead is "momentarily obscured" as it will "morph" into a message from the retailer for its "power of frozen" campaign. It is part of a multi-platform partnership between Mail Brands, the ad sales arm of the Daily Mail and MailOnline, and Iceland that celebrates the food company's "countdown to Christmas" that began on 9 November. There have also been "native" sponsored editorial pull-outs, an outside back cover feature in The Mail on Sunday’s You magazine, sponsored content pieces on MailOnline and "high-impact" online and mobile ads. Sarah Gibson, the partnerships operations director at Mail Brands UK, said: "We have never disrupted our iconic logo in the UK before and are excited to be working with Iceland on this striking media first. "Forming a significant portion of a major new partnership campaign, the logo morph is a brilliant example of the inventiveness of our cross-platform offerings and will provide Iceland's #PowerofFrozen activity with real momentum this festive season." Media agency the7stars brokered the deal for Iceland which is keen to move upmarket. MailBrands is embracing such partnerships as print advertising has suffered steep falls this year.